Happy in 90™ is designed to inspire you to discover your best self. Igniting the best in you means you can live more freely, happily, courageously, creatively, and lovingly. Regardless of how any one person feels during a given day, week, year, or decade, he or she has a deep-rooted desire to live to this simple truth: We were all born to be happy, healthy, abundant, and fulfilled. If registering for Happy in 90™ is not right for at the moment, we still provide you with inspiring content, wisdom, suggestions, and images. Please feel free to explore and enjoy the free content to keep you encouraged and engaged in a fearless pursuit of happiness. Enlightened Essays - Karen Garvey writes uplifting essays designed to allow the reader to wake up, feel inspired, or see something from a new perspective. 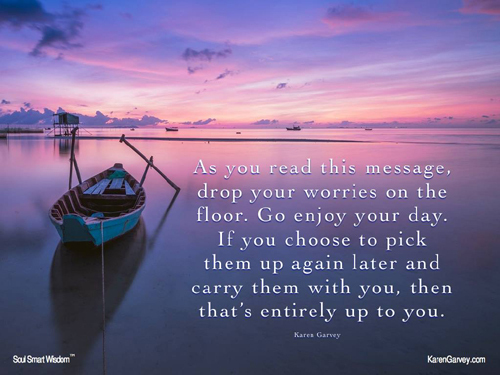 Magical Moments - Check out magical and motivational videos featuring Karen Garvey or Karen Garvey's wisdom. Inspirational Images - Based on the insights Garvey has gained in the years since her profound "wake-up" moment on 9/11/2001, she has created beautiful memes and messages for you to ponder and enjoy. If you have any questions regarding Happy in 90™, please visit our FAQs page.